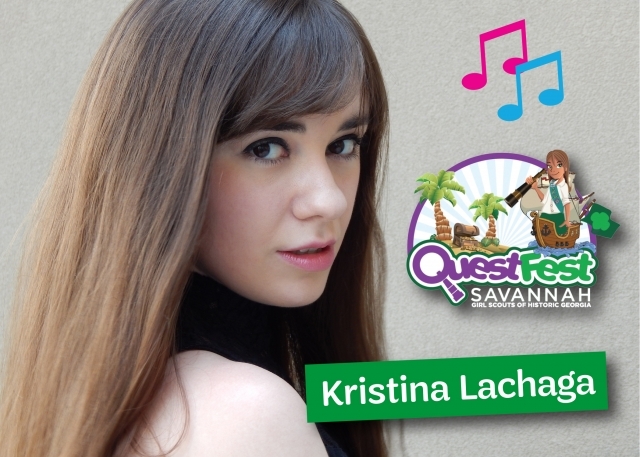 7/14: Kristina Lachaga is headlining Girl Scouts' QuestFest 2018 at the Savannah Civic Center! #Heartbreakers! Big news!! Kristina Lachaga, "The Girl With The Big Pink Heart™," is performing at Girl Scouts' QuestFest 2018! Kristina can't wait to headline the G.I.R.L. Concert (which features a Meet & Greet!) on Saturday, July 14th at the Savannah Civic Center in Savannah, Georgia! "The Girl With The Big Pink Heart™" is SO excited to sing her heart out for you and see YOU in Savannah! Click HERE for more info & to purchase concert tickets! P.S. Kristina will also have #Heartbreaker merchandise available for purchase at the concert! Already registered for QuestFest? Do I need to be a Girl Scout to attend the G.I.R.L. concert? Questions about tickets/how to purchase? Read on! You do *not* need to be a Girl Scout or attending QuestFest to purchase a concert ticket! General Admission concert tickets are $20 and are available for purchase through July 1st. Click here to purchase tickets - just sign up as a Non-Quester! Attending QuestFest 2018? Tickets are included in QuestFest registration, but additional tickets are available as well. If you need to register a tagalong for an add-on event, simply sign the up as a Non-Quester. (They'll be able to register not only for the concert but for any of our other add-on events too). General admission tickets to our Award Ceremony & G.I.R.L. Showcase Concert are $20. All sales benefit Girl Scouts of Historic Georgia. For additional questions regarding QuestFest 2018 or purchasing concert tickets, please send a Facebook message HERE or call 912.236.1571.